The Healthy Homes Coalition is an outgrowth of the successful Get the Lead Out! campaign, and was incorporated in the summer of 2006 to sustain the effort to end childhood lead poisoning in Grand Rapids and to apply lessons learned from lead to other children's environmental health issues related to housing. The Get the Lead Out! 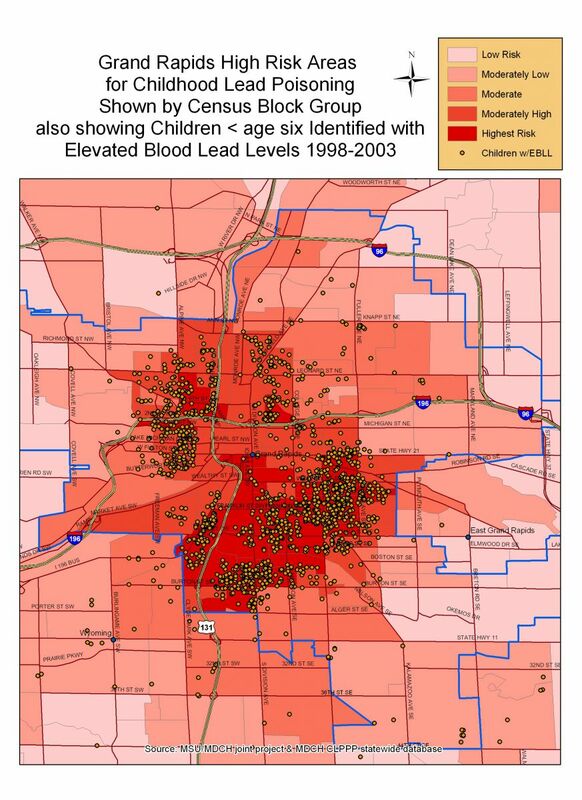 collaborative was formed in 2001 in response to local data that called out the environmental injustice of childhood lead poisoning in Grand Rapids, Michigan. In 2000, 559 Kent County children 0-5 years of age were identified with elevated blood lead levels. More than 90% of those children lived in the city of Grand Rapids. More than 90% were low-income (Medicaid). And the vast majority were children of color. A map similar to the one on the top of this page showed the huge disparity. 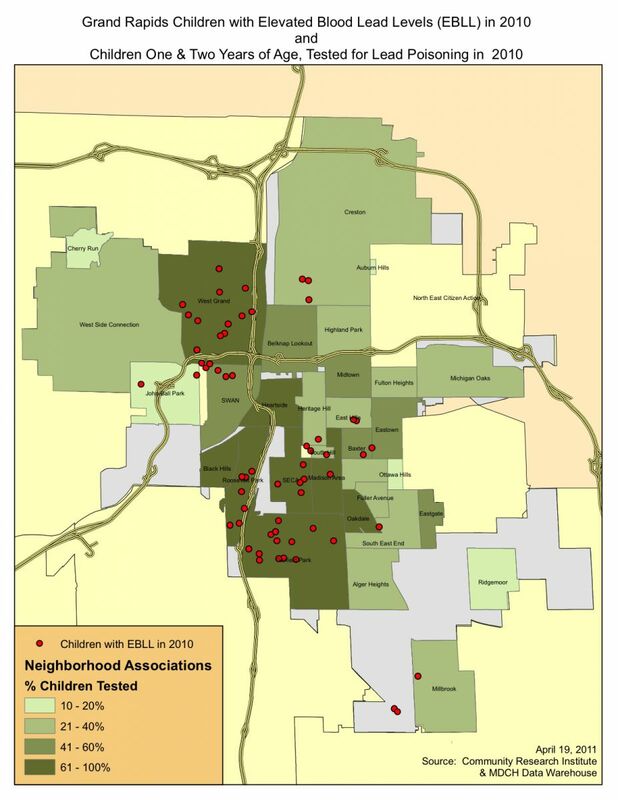 In the north end of the Baxter neighborhood, two out of every five children tested in 1998 had elevated blood lead levels. The Get the Lead Out! collaborative was facilitated as a pilot project of the Community Leadership Institute at Aquinas College. As the pilot phase came to an end in 2005, collaborative leaders met to plan for the future. 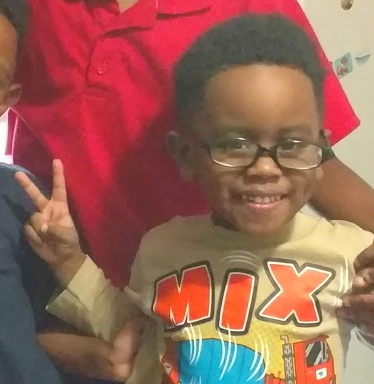 Even though the incidence of childhood lead poisoning in Grand Rapids' neighborhoods was cut by more than 60%, the group decided that the work to end childhood lead poisoning needed to continue, and that we needed to take lessons learned from the successful Get the Lead Out! campaign and apply them to other children's environmental health issues. 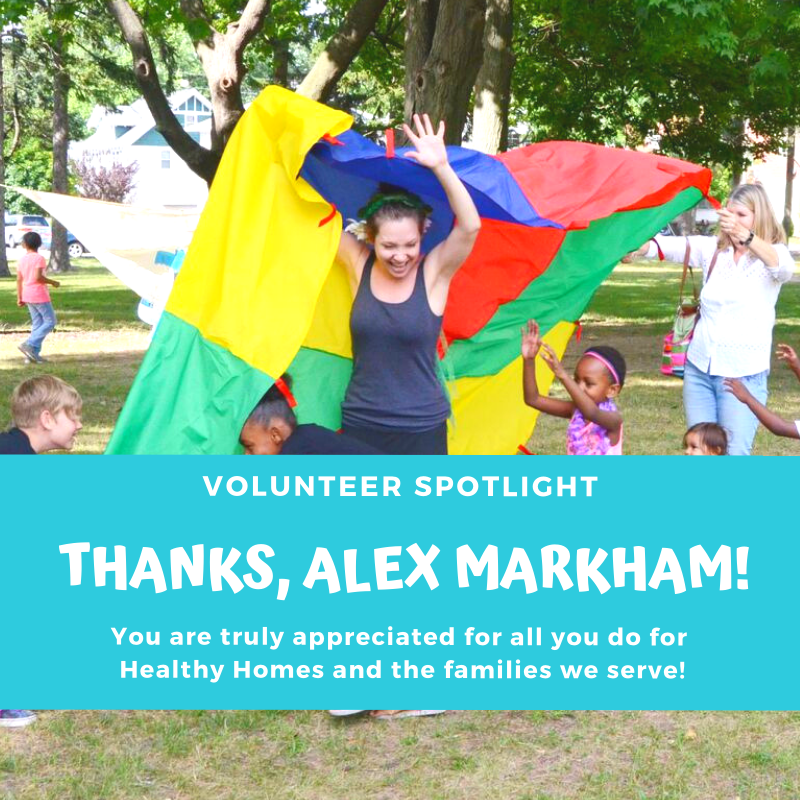 To sustain these efforts, the Healthy Homes Coalition of West Michigan was incorporated as a non-profit organization with the State of Michigan in August 2006, the same year that the Get the Lead Out! campaign was recognized by the U.S. Environmental Protection Agency with a Children's Environmental Health Excellence Award. Shortly thereafter the organization secured its tax-exempt status with the IRS. In the early years, the Healthy Homes Coalition focused on lead poisoning, radon and carbon monoxide as priority issues of concern. With FEMA support, the issue of fire safety was added to our work. Since those early days, research and listening to the community has revealed that asthma is a priority concerns that can be impacted by addressing children's housing. The connections between asthma and housing conditions is clear not only for asthma attacks, but also for the development of asthma. As a result, the Healthy Homes Coalition is now assisting nearly as many families with asthma concerns as with lead poisoning concerns. Services for families with children with asthma include tailored home assessments, linking to asthma-specific resources, and assistance with integrated pest management. All of these things are done in an effort to help children control their asthma and reduce trips to the emergency room, hospitalizations, and missed school days. The Healthy Homes Coalition is continuing to develop environmental intervention strategies for asthma that support improved health outcomes and thus and leverage health care investment to improve housing conditions. Today, the Healthy Homes Coalition is continuing to build a strong, solid foundation to eliminate these threats and continue to build a comprehensive approach to ensuring that children's homes are healthy and free from environmental harm. Consider joining us and being a part of our future! Children at one and two years of age are at the highest risk of being lead poisoned.